The sequel to the Hollywood blockbuster, The Chronicles of Narnia - The Lion, The Witch and the Wardrobe returns on DVD and Blu-Ray in The Chronicles of Narnia: Prince Caspian that once again unites William Moseley (Peter), Anna Popplewell (Susan), Skandar Keynes (Edmund) and Georgie Henley (Lucy) as the Pevensiechildren who are drawn into the amazing world of Narnia. Since their last visit to Narnia, they have discovered that several centuries have passed and the Narnians, those creatures of myth have retreated into the forests due to the abundance of man. The children also discover that they are now the legendary Kings and Queens of Old, however the face of Narnia has changed considerably since their last visit and magic has almost disappeared. Fortunately for the Narnians, Prince Caspian (Ben Barnes) is attempting to force an alliance between the two, unfortunately there are men who have darker motives causing this war to continue. It's classic adventure for the entire family. 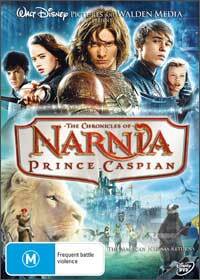 The original movie was extremely faithful to the first novel by C. S. Lewis as is the sequel, however Prince Caspian has a much darker undertone as the characters have matured and so has the storyline. Peter and Susan are now leaders, however they have also discovered that this is their last trip to Narnia and when the battle goes poorly for the Narnians, it is up to Lucy to find the fabled lion, Aslan and whether he still exists in Narnia. With stunning cinematography, director Andrew Adamson has truly created a modern masterpiece based on a classic novel that pays homage to the classic novels by C. S. Lewis. With 16:9 enhanced widescreen and true Dolby Digital 5.1, The Chronicles of Narnia: Prince Caspian is a truly impressive film that not only contains an engaging and rich story but brilliant video and audio quality. Definitely a movie for the entire family and a must have for Christmas!